I made a point of joining an able-bodied athletics club, at Spenborough, West Yorkshire to train. The reason for this was that I had already realised, I needed some athletic coaching on a full time basis - rather than just at squad training weekends, every 6 weeks. That was why I wanted to join an able-bodied club: to get access to the professional coaching. 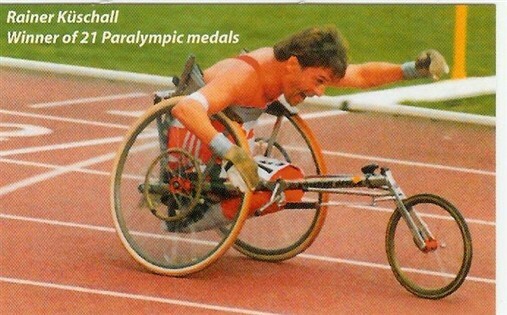 Of course it wasn’t that easy in 1981, because no one had ever considered taking on a disabled athlete, in fact prior to joining the athletics club, I had initially been refused access to the club, because of fears that my wheelchair would damage the track." 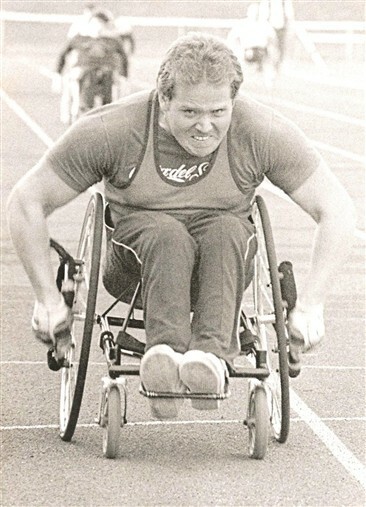 "In the 1970s, they had finally introduced a 60 metre race for quads at the wheelchair games. Before that there had been no races for quadriplegics. I first entered the 60 metres at Arnhem in 1980; but in that Olympics it didn’t work for me doing both table tennis and racing, so I dropped table tennis to concentrate on the racing and that became my new passion. I was training at my hospital in underground wards; racing up and down and crashing into the walls. 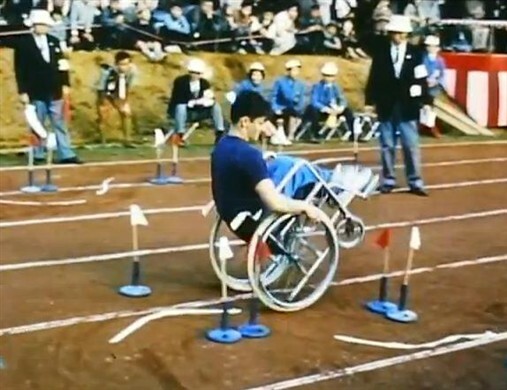 Guttmann maintained that quadriplegics shouldn’t race more than 60 metres because they would collapse if they tried to race a greater distance (part of the quadriplegic condition is an inability to raise your blood pressure). What Guttmann said went at the time, so there was no race for quads greater than 60 metres. After a few years that attitude changed and they started to introduce greater race distances: 100, 200 and then the 400 and on up to 5,000 and eventually the Marathon. I could never power a good start, so I was never a sprinter so I ended up concentrating on the long distance races: the 5,000 and the Marathon. Heine Köberle was my hero at the time; he was the first quad athlete to move across from longer distances and start competing in the Marathon. So then I did that too; I got fascinated by the idea of the distance. The move into distance racing was partly determined by my condition. I didn’t have the muscles for power or for acceleration and because of my anaerobic condition caused by low blood pressure I could'nt maintain effort for long periods. So I developed a technique that combined using a very small diameter push ring on my chair (which was a bit like using a very small back cog on a bike) with my interval technique for racing where I would push hard and then pause while waiting for the blood to flow back into my muscles and then push again. By using the high gearing I got from the small push ring I could achieve a very high speed and then it was less effort to maintain it during the intervals of recovery. This technique worked well for distance races where my speed allowed me to catch up on the dozen meters that I would typically be behind at the beginning of a race due to my slower starting and high gearing."